A special shotgun season for deer hunting is opening in Suffolk on Monday, and this year hunters will have access to expanded territories. In order to manage the ever-growing deer population in Suffolk County, the Department of Environmental Conservation announced a special shotgun season for deer hunting. The season begins Monday, the 7th, and lasts through the end of January. Hunting will be permitted Monday through Friday from sunrise to sunset, and is closed on weekends. For the first time in 15 years, the DEC is offering larger hunting territories. While hunters will still have to abide by town ordinances, the hunting range has been expanded in East Hampton and Southampton on the South Shore. Enterprise Park in Calverton is one area on the North Shore that hunters can take aim during the season. Town of Southold is opening an additional 150 acres for hunting, making the total around 450, however hunting in the town is restricted to the bowhunting season as the town prohibits special firearms seasons. Crossbow hunting is prohibited during firearms season throughout Suffolk County. Waterfowl and upland shooting is also prohibited during deer season. DEC officials have reported that more deer are being spotted in western Long Island, which is an indication that their populations have outgrown the habitats out east. 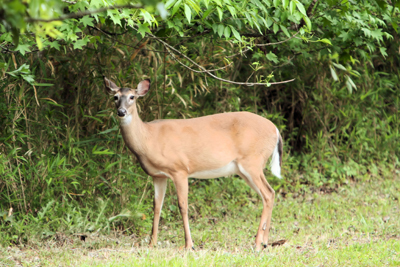 The DEC does not have an estimate on the total deer population, but East Hampton Village is reportedly on a quest to quantify its deer population. The number of permits granted varies by town, and residents who are interested so look to acquire one as soon as possible. Tags and permits are required for anyone planning on hunting on the East End. The DEC will be increasing patrols to ensure compliance with their regulations. Subject: LongIsland.com - Your Name sent you Article details of "DEC Announces Special Shotgun Season for Deer Hunting in Suffolk"